Genesis 2:18-23Symbolically, Eve emerges from Adam’s side as he sleeps. There is a small slash on his side to show the area where his “rib” was removed to create Eve. 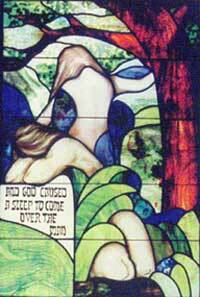 She and Adam are situated in the Garden, all art glass, which makes the image visible on both sides of the window. The Bible states that there was water in the Garden. A small body of water is seen at Eve’s right side. Eve reached up to the Tree of Knowledge, but her hand is not shown, as this is the moment of her creation, not the embracement of man’s fate.